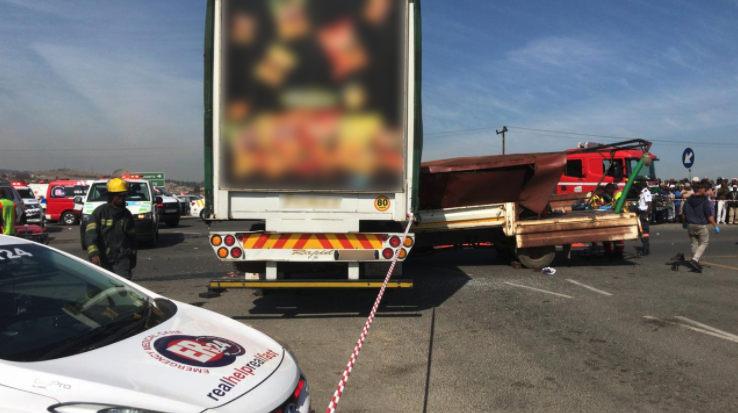 Four people have been killed and approximately fifteen others injured following a collision between two trucks on Malibongwe Drive in Cosmo City. ER24 paramedics, along with several other services, arrived on the scene shortly after 08h00. Two trucks were found in the middle of the road, one partially beneath the other. Several people that had been on the back of one of the trucks were found scattered around the scene. Local authorities began to close off the road while paramedics began to triage the patients. Upon assessment, paramedics found that four people had sustained numerous, fatal injuries. Unfortunately, nothing could be done for them and they were declared dead. Approximately fifteen other patients were assessed. Four were found to be in a critical condition while the remaining patients had sustained minor to moderate injuries. The patients were treated for their injuries, and the critically injured provided with advanced life support interventions. Three of the critically injured were airlifted to nearby hospitals, one by the ER24 Oneplan Helicopter. The remaining patients were transported by ambulance.